Formula 1 bosses are considering allowing teams freedom to choose the tyres they take to each race. Tyre supplier Pirelli currently chooses two types of tyre for each track out of the four compounds they supply. The proposal, which originated from the Force India team and to which governing body the FIA is open, is to allow teams to pick two compounds themselves. Letting teams choose would introduce extra variety and the potential to mix up the field from race to race. However Pirelli is concerned there would be a risk of some teams picking tyres that were too soft for certain tracks so they could achieve better grid positions by using tyres that were unsuitable for races. Pirelli's motorsport director Paul Hembery said nobody had spoken to the supplier to "explain why they need to do it", adding the change could still result in teams having the same compounds for a race weekend. He said the company took into account track layout, conditions, surface and temperature ranges before selecting tyres. Each driver is provided with 13 sets of dry-weather tyres, four sets of intermediates and three sets of wet tyres across a race weekend. Hembery said: "You'd have people who maybe need to risk more taking decisions that would create a safety problem. "You have to take into account some of the extreme conditions and it might mean someone making a choice we would not feel is correct." Hembery also claimed costs would triple with the suggested change. He said: "There is a logistical problem; the impossibility to sea freight, you'd have to start air-freighting." Force India deputy team principal Bob Fernley told BBC Sport he would like to see the system introduced for the Belgian Grand Prix at the end of August. Other senior insiders say it could be applied from the start of next season. Either is possible as it would require only a tweak to the sporting regulations, which does not need unanimity among the teams. 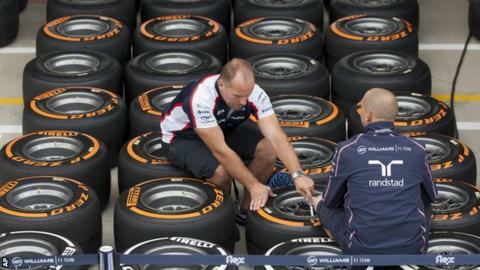 The idea has arisen out of a feeling among teams that F1's use of tyres could be improved. Pirelli is operating to a mandate dictated by F1 boss Bernie Ecclestone to produce tyres that degrade quickly, to promote races in which drivers have to make multiple pit stops. But drivers privately have misgivings about the effect that has on races, during which they have to drive well within themselves for the vast majority of the time to ensure tyres last for the required number of laps. Many senior insiders would prefer tyres on which drivers could push harder for longer periods, though most want to retain at least two pit stops per race. The teams and FIA are considering a series of changes for 2017 to make the cars faster, more dramatic looking and harder to drive. These focus on changes to the chassis rules and are likely to see wider cars with wider, lower-profile tyres. Pirelli's contract expires at the end of 2016 and the FIA is planning a full tender process as part of the decision on a new supplier. That could include a change to what is demanded of the tyre manufacturer.